Prince Edward Island has so many local treasures. Who better to share them than locals themselves? We asked those who know the Island inside and out for their favourite dishes, lookouts, and adventures – and they let us in on their top picks. After all, the best way to see Prince Edward Island is to do as the locals do! “The best part about PEI lobster is its freshness. You can have it the day it’s caught! There are so many different and delicious ways to enjoy it, the local chefs are adventurous in coming up with such tasty and diverse recipes. And an added bonus – buying Island lobster ensures not only a delicious meal, but it also supports local businesses and the hardworking fishermen!” – Jo M.
Digging into a “feed’ of PEI lobster should be on the “to do’ list of any Island visitor. Whether you cook them yourself or head to one of the lobster suppers that dot our beautiful province, you are in for a treat. “I visited Basin Head Beach for the first time two years ago and found it to be so very beautiful. We make it down East to this beach once every summer with our family. I would recommend to everyone, to visit this area.” – Paula R.
Basin Head Beach was named the top beach in Canada by Vacay.ca. Run your feet through the sand on this beach and it will sing! Really, we’re not kidding… read about the singing sands here. “COWS is not just delicious, but world-renowned. My friends from away are always after me to bring a pint along on road-trips when I go to visit, and the first thing we do when they come to the Island is catch up over a scoop or two of Wowie Cowie. ” – Bertha R.
COWS started as a small ice cream shop in Cavendish in 1983, and has grown to produce more than 32 flavours, have 12 locations across Canada, and receive many awards such as World’s Best by Tauck World Discovery. COWS uses only the finest ingredients, including fresh Prince Edward Island berries for its Strawberry ice cream, and each ice cream is served in a handmade waffle cone made one at a time right at the counter. “My favourite part about golfing in PEI is that like everything else on the Island, it’s relaxing. The prices are low, courses are always in great shape and the staff is so friendly. When I’m in Charlottetown I love to play Fox Meadow Golf Course, it’s only 5 minutes from downtown and the 7th hole makes you feel like you’re at TPC Sawgrass!” – John N.
PEI is known far and wide as being a world-class golf destination. With over 400 fairways that range from descending hills with picturesque coastal views to forested corridors hugged by sparkling lakes, it’s easy to understand what attracts the pros and amateur golfers alike. “My family always has so much fun at Shining Waters. I love that there is something for all ages, my 5 year old could spend the whole day splashing in the smaller water area while my 12 year old loves the bigger slides. Everything is very clean & friendly staffed. So much fun, you leave happy and exhausted!” – Eve L.
Shining Waters in Cavendish is home to thrilling roller coasters, winding forest trails, fun children’s rides and fast-paced water slides! Locals suggest starting off the day with dry activities and then packing a change of clothes to tackle water rides in the afternoon. “Music has always been a part of getting away from worries and so going to the Acadian Festival with all the festivities of music and dance, friendship, meeting up with old friends, making new ones, enjoying the displays of vegetables, handicrafts, homemade cooked meals, is like going home again. 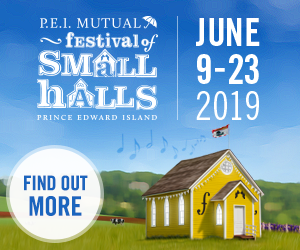 Emotions, for me, run high at this weekend of festivities and seeing the culture survive in the younger generations coming up is absolutely gratifying.” – Lucia C.
The Evangeline Region showcases Prince Edward Island’s vibrant Acadian French culture. Whether you’re a music lover, history buff, culinary connoisseur or outdoors adventurer, there’s something for everyone. “Robinson’s Island boasts a trail that’s about 5km and is both biker and hiker friendly. It offers options for longer or shorter expeditions – which I personally like, so I can choose the perfect option for my time availability. Along the route there are a couple of beach access areas where hikers/bikers can spend some quality beach time!” – Pam M.
Robinson’s Island provides a lookout over the North Shore that is unlike any other on PEI. If you’re not much of a hiker, the drive up is equally as beautiful as the trail! “I loved the atmosphere when I walked into Point Prim Chowder House. It was like walking into a family home I’d known already. Sitting on the deck beside the ocean was so nice. And the Lobster Roll was the best I’ve ever had!” – Karen B. Located next to PEI’s oldest and most historic lighthouse, Point Prim Chowder House provides an ocean-front experience you won’t soon forget. Make sure to try the famous steamer pot or any one of their delicious seafood chowders! “The Richmond Dairy Bar’s ice-cream is so good – it’s so smooth! The Dairy Bar is also a great place for seafood – try the lobster burger! The location is perfect while exploring the western region of PEI (it’s on the Route 2 highway), and it’s very close to the Confederation Trail so you can stop in while biking the trails!” – Elaine N.
Centrally located in West Prince, this local gem is a great way to start or end off your Western PEI adventure! “The Confederation Centre is the cultural hub of Charlottetown. The Centre attracts world-class, unique theatre and art exhibits. I get to experience many cultures of the world without leaving PEI!” – Hannah N.
The Confederation Centre of the Arts has many different activities, it’s not just theatre! There is a world-class art gallery to peruse, restaurant to enjoy, courtyard to walk through and gift shop to browse. Of course, the theatre is also fantastic. Taking in a show at the Homburg Theatre whisks you away to different eras and locations all while relaxing in a cozy red seat! For more things to discover on Prince Edward Island, check out Hidden Gems You Can’t Miss, 11 Rainy Day Activities, and Ways to Get Out on the Water.